Beautiful Kirra Beach Apartments are spacious, fully self-contained units with 51 north facing balconies, most with beautiful ocean views. They are set amongst landscaped grounds and opposite the patrolled Kirra Beach for surfing and swimming, famous for its surf breaks and clear water. A short taxi from the Gold Coast Airport though miles from the flight paths. 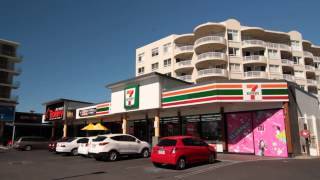 A 10 minute walk around the beachfront to Coolangatta. Both their brochure and website have detailed maps on the location of the building in relation to the area. The bedrooms are spacious and well appointed, with large balconies. The property consists of one bedroom apartments, two bedrooms apartments, two bedroom plus studio apartments, three bedroom apartments and four bedroom roof top penthouses. Everything at Kirra Beach Apartments has been tastefully decorated - you'll feel right at home. Imagine yourself on top of the world with magnificent picturesque 360-degree Ocean and Hinterland Views. Beaut accommodation for larger families and multi generations. The four bedroom penthouses are fully self-contained, fully air-conditioned with excellent views of the world-renowned Kirra Beach famous for surfing, swimming, surf breaks and clear water. Bedding configuration is one queen in master bedroom, one queen in second bedroom, two singles in third bedroom and luxurious fold down double in the fourth bedroom / games room. Two bathrooms the en suite with a full size spa bath, fully equipped kitchen, laundry, spacious living area / lounge and private balconies. Rates for six people. Maximum occupancy is nine; charges apply for extra guest. Free Foxtel cable movies and free WiFi. Take a break in a self-contained well appointed apartment with beautiful tropical garden and pool views, private balcony, free Foxtel/cable and movies, free under cover parking and free WiFi available in every apartment. Rate is for five people. Maximum occupancy is six. Extra charge for extra person. Bedding configuration is one queen and two single beds and a single bed in the studio room. Beachside Accommodation, fully self-contained, fully air-conditioned apartments with delightful views of the fabulous Kirra Beach. Comprising of two bedrooms (queen bed in the master bedroom and twin singles or a double bed in the second), two bathrooms, fully equipped kitchen, laundry, living area / lounge and private balconies. A parking space in a secure underground car park is also available (a 2.1 metre height restriction applies). Rates are for four people. Free Foxtel cable and movies. Free WiFi available in every apartment. Stunning beachside accommodation, fully self-contained, fully air-conditioned apartments with beautiful views of the tropical gardens and swimming pool and spa area a short stroll to the fabulous Kirra Beach. Comprising of two bedrooms (queen bed in the master bedroom and twin singles beds in the second), two bathrooms, fully equipped kitchen, laundry, living area / lounge and private balconies. A parking space in a secure underground car park is also available (a 2.1 metre height restriction applies). Rates are for four people. Free Foxtel cable and movies. Free WiFi broadband available in every apartment. For the discerning holiday maker. 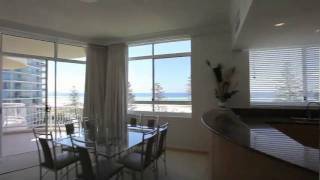 Fully self-contained, fully air-conditioned apartments overlooking the fabulous Kirra Beach. Comprising of two bedrooms plus a studio room (queen bed in the master bedroom, twin singles in the second and a single in the studio), two bathrooms, fully equipped kitchen, laundry, living area / lounge and private balconies. A parking space in a secure underground car park is also available (a 2.1 metre height restriction applies). Rates are for five people. Maximum occupancy is six people; charges apply for the extra guest. Free Foxtel cable and movies. Free WiFi available in every apartment. Spacious beachside accommodation, fully self-contained, air-conditioned one bedroom apartments many with views overlooking fabulous Kirra Beach. The one bedroom apartments include a queen bed in the master bedroom with ensuite bathroom. 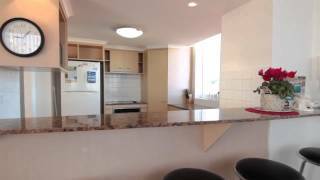 A fully equipped self-contained kitchen, laundry, living / dining area with television, balcony, free Foxtel cable television and movies. A parking space in a secure underground car park is available (a 2.1 metre height restriction applies). For extra family friendly needs, the three bedroom apartments are fully self-contained, fully air-conditioned apartments with views of the world-renowned Kirra Beach famous for surfing, swimming, surf breaks and clear water. Three bedrooms (queen bed in master bedroom, a double in second and twin singles in third), fully equipped kitchen, laundry, living area/lounge and private balconies. Parking space in secure underground car park is also available (a 2.1 metre height restriction applies). Rates are for six people. Maximum occupancy is seven people; charges apply for the extra guest. These apartments have larger bedrooms and two bathrooms. Free Foxtel cable and movies. Free WiFi. Ring direct to check for availability on this style of apartment.